Heart surgeons are using extreme cooling to allow them to stop a patient's heart long enough to carry out surgery and then revive them. "The body is essentially in true, real-life, suspended animation, with no pulse, no blood pressure, no signs of brain activity," explains Dr John Elefteriades. At Yale University's New Haven hospital, he has made a craft of this life-saving but hazardous technique. The patients undergo induced hypothermia. Their body is cooled from its normal temperature of 37C (98.6F) to just 18C (64.4F). The patient is indistinguishable from someone who is actually dead. But crucially the cold slows the body's processes offering a window for surgery before risk of brain damage. 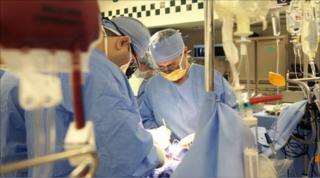 Once surgery is complete, the patient is warmed up and their heart restarted with a defibrillator. "There is no room for error or failure really - that would be catastrophic," says Dr Elefteriades. "It is the most fascinating technique to which I have ever been exposed in medicine and each time, it seems a miracle to me that it works." For heart surgeons like Dr Elefteriades, operating on a beating heart presents obvious challenges. Some operations are difficult, if not impossible, if the heart cannot first be isolated and stopped. Surgeons can and do provoke cardiac arrest, stopping the heart, but under usual circumstances, they rely upon heart-lung bypass machines to replace its function for the duration of surgery. This technique is now so commonplace that it is almost considered routine. But sometimes heart-lung bypass is not an option and induced hypothermia is now proving a powerful alternative. The technique of extreme cooling is fascinating. It takes the moment of death and smears it out. By putting the whole body in a sort of metabolic slow motion it also slows the process of dying, buying clinicians and patients precious time. But it is a double-edged sword. Cooling to these extremes is about as likely to kill you as it is to cure you and these hazards need to be negotiated. This has led to deep hypothermia becoming less fashionable as a technique until recently, when its potential to enable seemingly impossible operations became clear. Leading researchers can now use induced hypothermia to offer life-saving surgery in previously inoperable frontline medical situations, such as neonatal brain injuries, cardiac arrest and major traumas. This is the case for 59-year-old Esmail Dehzbod, who needed complicated repairs to the great blood vessels immediately surrounding his heart to prevent the fatal rupture of an aneurysm of his aorta. Life-saving surgery was absolutely necessary, but in Mr Dehzbod's case, once the function of his heart had been stopped, it could not be replaced. Because of the position of the aneurysm, surgeons would need to cut off the blood supply to his brain, which, in a traditional bypass operation, would starve it of oxygen and lead to brain damage. Instead, Dr Elefteriades chose to stop Mr Dezhbod's heart by inducing hypothermia. This would leave him without a circulation and indistinguishable from someone dead but crucially, would slow his metabolic process and allow time for the difficult repair before the dying process became irreversible. Mr Dezhbod expressed his fears ahead of undergoing such a high-risk operation. "I'm concerned about my children. I cannot mention reality because it will hurt them. This morning I hugged them and kissed them and mentioned everything will be ok - but it will be a risk too." These remarkable feats of surgery are a race against the clock of life. The risks are huge but for Mr Dezhbod there was no better alternative. And remarkably, his operation proved successful and he was successfully revived. "I have pain - it is not easy - but I know it will be a good end and I know that my problem has been solved." Medical breakthroughs often begin with an accident. Some 11 years ago, Anna Bagenholme, a 29-year-old skier, fell through ice covering a ravine in Norway. Her heart stopped for more than three hours and her body temperature dropped to 13.7C (56.7F). This is the longest and coldest cardiac arrest on record and that she survived at all is nothing short of miraculous. This case alters the very concept of life and death and reminds us that death itself is not an event but a process. A process that might be manipulated to our advantage. The idea of extreme cooling to save lives might appear simple but as a technique, it is as powerful as it is enigmatic - and it has the potential to bring hope where historically there has been none. Dr Kevin Fong presents Horizon: Back From The Dead on BBC Two, on Monday 27 September at 2100 BST.